Boston Market Corporation, headquartered in Golden, Colorado, has given time back to busy families and individuals for 30 years with quality, home-style meals at a convenient value in 457 locations nationwide. 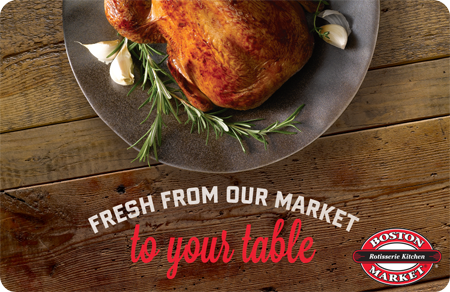 A staple on dinner tables, Boston Market prepares its fresh, never-frozen, natural chicken in signature rotisserie ovens and features an extensive selection of home-style sides and made-from-scratch cornbread. For more information, visit www.bostonmarket.com. As one of the country’s largest providers of catering services, Boston Market offers convenient, same-day delivery service for orders for corporate and personal events of all sizes. Give the gift of time to your gift card recipients; give them Boston Market! Use Boston Market Gift Cards for any kind of program! Why choose Boston Market gift cards? Non-denominated gift cards are available and can be loaded from $5-$250. Yes, your order can include any number of gift cards in any denomination you choose. Orders are shipped via UPS Two Day Service within 5-7 business days of payment receipt. Boston Market gift cards are shipped in bulk to a single location. No, gift cards are shipped inactive and activated once receipt is confirmed. No, there is no denomination printed on the gift card. No, Boston Market gift cards have no expiration dates. No, Boston Market gift cards have no dormancy fees or other fees. No, Boston Market gift cards can only be used to make purchases at Boston Market stores. Gift cards cannot to redeemed for cash. Boston Market gift cards can be redeemed at 457 stores nationwide. Gift cards can be reloaded at any Boston Market location. Gift cards will not be replaced if lost, stolen, destroyed, altered, or used without the recipient’s permission.